Can I Eat the Peel on Kombucha Squash? Kabocha squash -- often confused with "kombucha," the fermented drink -- is a popular type of squash known for having a dry texture and, you guessed it, an edible peel. Kabocha squash, like other squash varieties, is high in fiber and beta-carotene, and eating the peel adds even more fiber per serving. The peel on a kabocha squash is thinner than most squash and softens up at high temperatures. Kabocha squash is a type of winter squash with a long shelf-life. One cup of cooked kabocha squash has 115 calories, including 30 g carbohydrates and 9 g fiber. Kabocha squash is a low-fat, low-sodium food with less than 2 g fat per one cup serving and less than 10 mg sodium. Kabocha squash is high in beta-carotene, providing up to 20 percent of the daily value for most adults. 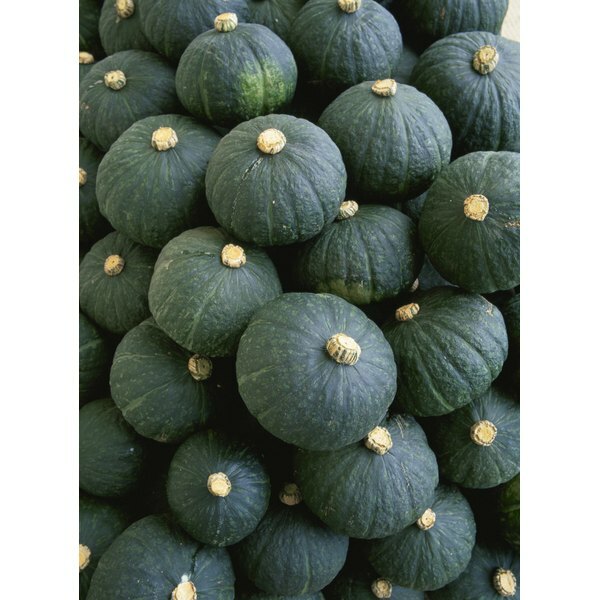 Kabocha squash is green with light green or white bumps and striations and intensely orange flesh. Despite its rough texture, the rind of a kabocha squash is soft enough to eat once it is cooked. The peel is safe to eat, but is always a good idea to wash it before cooking. The rind is high in fiber and vitamins and minerals. If you prefer not to eat the peel, you can cut it off with a small knife or vegetable peeler or remove it after cooking. Kabocha squash can be cut into sections, cubed or peeled and cooked whole. It can be boiled, steamed or baked. Kabocha squash is commonly fried in pieces as tempura in Japanese restaurants. When cooked, the flesh is sweet, soft and fluffy with a striking nutty flavor. All squash varieties are believed to have originated in Central or South America. Kabocha squash is primarily grown in places with a growing season of at least 100 days, including Japan, California, Colorado, Florida, Micronesia and New Zealand. Most of the kabocha squash grown in the U.S. and New Zealand is exported to Japan.